Thursday last, August 17th, was one of the first sunny days of the Summer. I couldn't resist the temptation to take a few scenes around the parish. 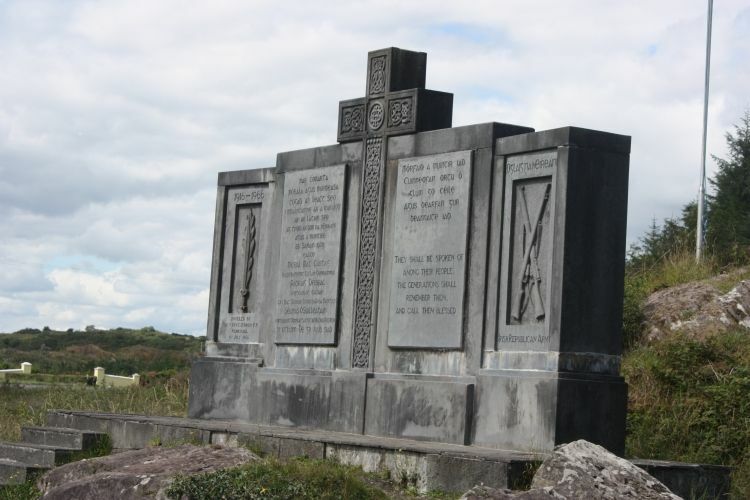 The Kilmichael Ambush Memorial is so iconic of our parish that we frequently don't even notice that it's there. It was erected in 1966, when the whole country was engaged in celebrating the 50th anniversary of the Easter Rising, to replace a simple iron cross with brass plate inscripton. The parish priest of the time, Fr Con O'Brien, was at the head of the committee which raised funds for this huge monument. It commemorates the deaths on the rock behind of the three Irish casualties of that engagement: Pat Deasy, Bandon, Michael McCarthy, Dunmanway and Séamus O'Sullivan, Rossmore. The dedication, in Irish and English, says: "They shall be spoken of among their people. The generations will remember them and call them blessed"
The top of Keimeen. 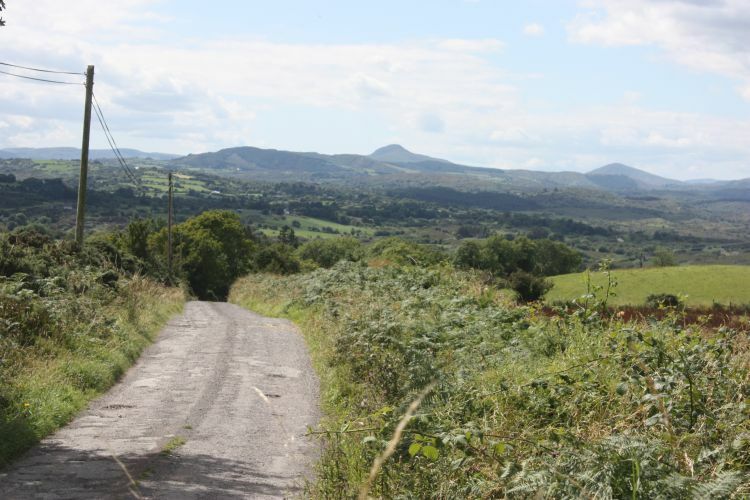 One of the best viewpoints in the parish is from the top of the steep road which goes from Toames to the Old Kilmichael Cemetery, through Ballina and Moneycusker. Looking west we see the summit of Shehy in the centre background. Terelton. Heading back home from Keimeen, I was inspired by the idea that this was an ideal day for another visit which I had thought about for a long time. 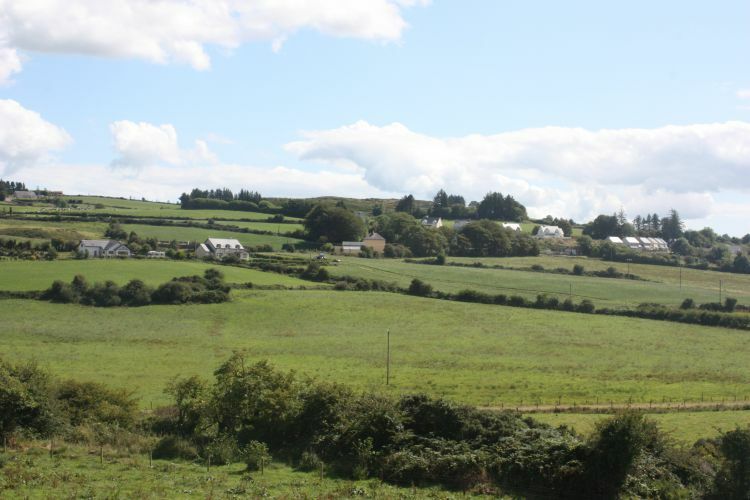 With the invitation of Kieran and Kit Kelleher, the present owners, I visited the farm which had been owned by my great-grandfather Anthony Barrett and where he reared his ten children, of whom my grandmother, Margaret Barret, was the only girl. Older parishioners might remember the late Tony Barrett and his wife, Joan Angland, who sold to Peter Kelleher and moved to Glanworth. I took many photos of the old house, occupied up to lately by members of the Kelleher family, and of the farm outbuildings which have been restored to their original condition as part of a heritage project by Kieran and Kit. The above view of Terelton, with the parish house in the centre, was taken from the farmyard.